In Part Two of the Know your Region Familiarisation Trips 2015 organised by Failte Ireland, Inishowen Tourism staff, take the opportunity to join other tourism industry counterparts to continue the journey around the County of Donegal. This is an opportunity to share “what to see and do” when you stay in Donegal. The second day trip starts from Letterkenny and takes in Signature point two of the Wild Atlantic Way located at Fanad Head. For the purposes of a convenient meeting point to start the day trip, the Mount Errigal Hotel was the designated point for the group of participants to convene; listening to the local representative from Failte Ireland giving an overview of the benefits of the Wild Atlantic Way to the tourist industry. A particular update to this section ensued, and in general terms of the project for those that may not have been on the first trip. As the journey starts in the morning leaving Letterkenny, the first port of call is the town of Ramelton via the R245.This Georgian historic town is situated at the mouth of the Lennon River where it enters the Lough Swilly. This location centralises a world-famous event; The Flight of The Earls from Kinnegar Beach in 1607 .The Heritage Centre in the town also has an impressive exhibition displaying the life and time of the Earls. There are several busy restaurants, pubs, self-catering cottages, shops, craft shops, hair salons, family activities and array of historical antiquities & attractions. Just over the other side of the river is “The Bridge Bar” one of the best music bars in the country. It has a cosy restaurant with good food, and renowned for its excellent fish. Heading out of the town, on the “Atlantic Drive” signposted as such, the next stop is Rathmullan. It is a bustling seaside village with a long sandy beach on the shores of Lough Swilly. Rathmullan also acts as the landing port for the Buncrana to Rathmullan Ferry connecting the Inishowen Peninsula via a short ferry ride across the bay. The Marina & Pier is the venue for a variety of different activities including water sports such as surfing, pier jumping, and kayaking, it is also ideal for coastal cruising and deep sea angling. Rathmullan serves as an important historical village as it was the scene of the Flight of the Earls in 1607 a major turning point in Irish history. An opportunity with Deirdra Friel from Donegal Heritage Trails introduces the Flight of the Earls Sculpture. This location also hosts one of Donegal’s 4 star luxury hotels. Rathmullan House is set in wooded grounds, and provides a tranquil experience overlooking Lough Swilly. A popular wedding venue and short break option, it is but a few steps from the long golden beach. A popular place to frequent here is “Salt n Batter”, a café that sells fresh fish and chips, sandwiches, wraps, coffee, and home-made desserts, simple, but tasty. After the first few years the menu developed into what it is today a real mix something for everybody. All cakes and desserts, wheaten bread, are made in house with Ronnie’s famous freshly made home-made seafood chowder, a tempting delight. The opening hours are 3pm- 10pm Mon thru Thurs, 3pm- 10.30 Fri. thru Sun. Rathmullan Community Festival, now running for 12 years, is becoming one of the most famous festivals in all of Ireland. It takes place in late July and hosts a number of different activities including a fair ground, live music, and much more. Craft beers and cottage industry crafts have become very popular with residents and visitors alike, so a site visit to the local Kinnegar Brewing Company to gain insight about this particular Wild Atlantic Way Experience. It offers enthusiasts a complete overview of the brewing process, beginning in the malt loft, and continuing through the brew house, the fermentation process, the conditioning cellar, and finally to packaging. All of this in a uniquely compact space! Afterwards, in the brewery’s Taproom at nearby Rathmullan House, visitors are welcome to taste the range appreciating the influence of different malts, hops and yeast have on the flavour profile and general character of individual beers. Tour participants receive a token for a beer. At this stage, a well-informed decision can be made as to which beer is the preferred taste and order. The next stop along the route (R268) is the first of what Failte Ireland term as a Discovery Point on this section (distinct sites, large and small, each chosen for their potential to offer visitors an authentic and intimate experience of the natural and wild landscape and seascape). Ballymastocker Strand can be accessed via a twisting cliff-top route along the Croaghaun Mountain. This is known as Ballymastocker Strand viewpoint. It is an elevated location that offers exceptional views over Ballymastocker Strand, Murren Hill and Fanad Peninsula. 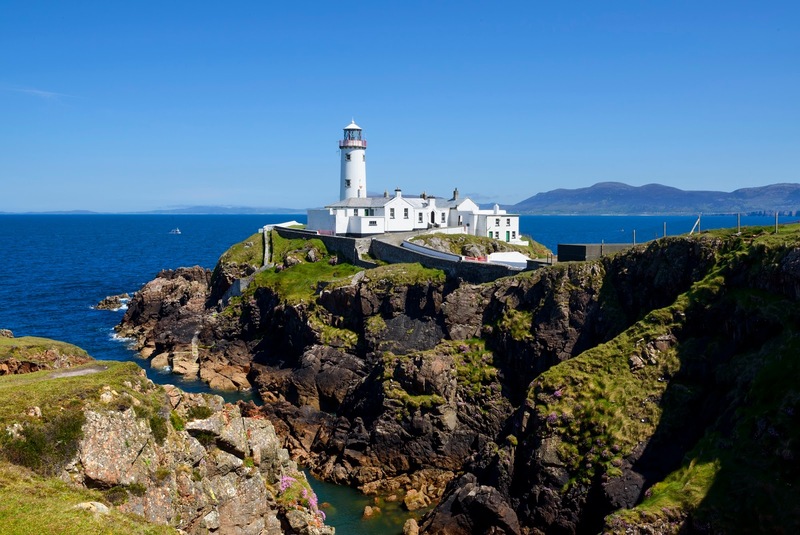 Making our way further north, Fanad Head beckons with a visit to the - Signature Discovery Point: Fanad Head / Visit Fanad Head Lighthouse. 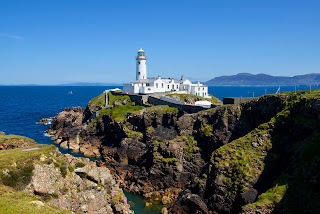 An introduction from a member of the Fanad Lighthouse Committee sets the scene where here man’s presence and his ability to exist in even the wildest of locations are seen in the form of Fanad Head Lighthouse. Now automated, the 39 meter lighthouse first shone its light on St. Patrick’s Day 1817 and has been the subject of many stunning photographs and paintings over the years. To pause a while and imagine what life was like in hurricane force winds on cold November nights nearly two centuries ago leaves a truly “Wild Atlantic” experience in the mind. Gazing on the unforgiving waters of the Northern Atlantic you can capture a view of Tory Island 14.5km (9 Miles) out to sea. Teas and coffee were available to visitors at nearby Fanad Lodge. Moving onwards starting our descent, the Discovery Point at Ballyhiernan Bay provides the next brief pause; the beach is set within an area of low lying land in a remote rural area, with the nearest village being Rosnakill (7km). Ballyhiernan beach car park is contained behind the dunes; the beach can be accessed by foot. It consists of a long sandy beach, confined on either side by rocky headlands, Rinboy Point to the West and Rinmore Point to the East. The next stop is Discovery Point, Island Roy View. This tiny undiscovered Island off the coast of Donegal is a place to get lost, to contemplate, to walk. So secluded is Oileánan Bhráighe that is often missing from maps. One has to explore to find it. At this point we are crossing the Harry Blaney Bridge that spans Mulroy Bay between the Rosguill and Fanad peninsulas of County Donegal. The Tramore Inn is situated on the Rosguill Peninsula... on the world famous Atlantic Drive,a must visit on the trip. This brings the tour to the next stop Discovery Point, Rossguill Peninsula. It is the ideal opportunity to have lunch at the Singing Pub, try their unique steak cooked on Lava stone. The best way to appreciate Rosguill's rugged splendour is by driving, cycling or even walking the 15km Atlantic Drive, a way marked loop on minor roads signposted to your left as you come into the sprawling village of Carrigart (CarraigAirt) from the south. There is a wealth of activities available locally: Angling, Hiking, Golf and Watersports. The sea views are superb, from the secluded beach at Trá na Rossan in the northern part of the peninsula. Moving on further south, the Discovery Point, Doe Castle View provides the next stop. Doe Castle viewpoint is accessed by the R245 a picturesque route which runs through a low lying landscape offering repeated views of the adjacent river Lackagh and nearby headland. The route is characterised by low to medium scrub vegetation which create the broken views and add to the interest. The elevated viewpoint has clear uninterrupted views toward Doe Castle and surrounding landscape. A visit to nearby Ards Forest Park is a must. It is one of the highlights for the avid explorer, or walking enthusiast visiting Donegal. There are acres of forest and beach walks, one of which is accessed via a boardwalk. With ample parking, picnic tables dotted around, and adventure playground activities to partake in; it meets the expectations of all the family. Another Discovery Point, Marble Hill provides an excellent surfing and rambling experience. Marble Hill beach is a very popular beach attracting lots of visitors in the summer time. This is one of the blue flag beaches in Donegal available in the bathing season which runs from June until the end of August. The Discovery Point is enclosed within the varied landscape of Sheephaven Bay, overlooking Clonmass Island and enveloped by Rosguill Peninsula to the north and the adjacent headland of Knockduff to the North West. The beach is accessed by foot via steps or through the sand dunes. Once again the road heads north to the next Discovery Point, Horn Head. This is an exceptional viewpoint giving uninterrupted coastal views of the Atlantic Ocean, the tip of Horn Head and the successive headlands to the North East. The Headland is characterised by low heath land scattered with some low growing, wind pruned coastal shrubs. . The next wondrous site is the more than twenty-metre high Marble Arch, cut by the sea through the base of Trawbreaga Head. Horn Head itself soon becomes visible as you ascend the next headland. As the day trip draws to an end, Dunfanaghy provides a convenient stop that joins up again to the N56. Dunfanaghy is a picturesque village, it boasts a three-mile-long sandy beach known as Killahoey Strand, and hosts the excellent opportunity to play a round of golf, or horseback ride over the beach from the nearby stables with a view to stay in nearby Arnolds Hotel. Time may be of the essence, so a visit to Café Arno for afternoon tea/coffee may just fit the schedule as our trip is homeward bound to Donegal Town where this concludes the Day Two experience of Donegal delights.